All transactions are safe and secure with a reliable history in online purchasing behind each of our associates. 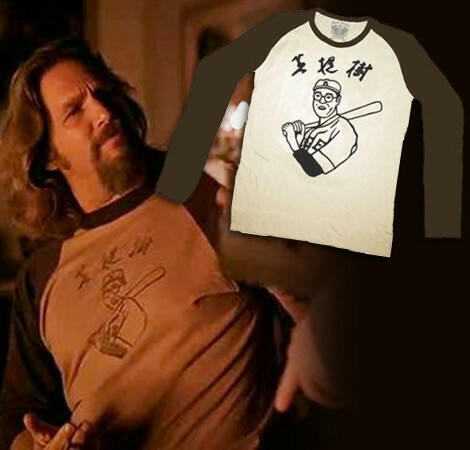 Buy the Big Lebowski Kaoru Betto Baseball Jersey to own Big Lebowski clothing and merchandise. This baseball jersey is nearly identical to the one The Dude wears in the movie. Choose from a variety of colors, including black sleeves on a white jersey. The man on the tee is Japanese baseball player Kaoru Betto, who was one of the first Japanese power hitters. He played for the Osaka Tigers in the late 1940s and became known as "The Gentleman of Baseball." The design's Japanese characters loosely translate to "Strongly Influential." The Kaoru Betto t-shirt worn in the movie actually belongs to Jeff Bridges. He also wore it in The Fisher King. In addition to the Big Lebowski Kaoru Betto Baseball Jersey above, browse the Big Lebowski Clothing Gallery for more apparel like men's and women's clothes, kids shirts or hoodies.